Features a deep vamp design with a tapered box, like ULANOVA II. 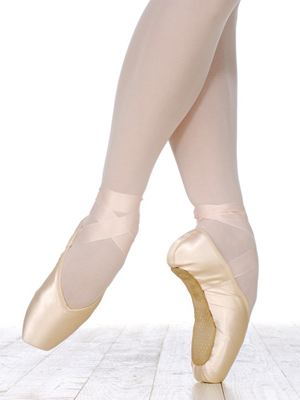 Ideal shoe for dancer with highly flexible arch, providing the greatest amount of support possible to the metatarsal. A good choice for long toes, especially if dancer's big toe or 2nd toe is long. Also good on narrow feet or narrow heels. Available in medium and hard shanks.